Lady's well is in the townland of Castletown. The well has a statue to Our Lady and is surrounded by a wall with steps leading down into the well. The feastday of the well is August 15th and each year a mass is held at the well, and is attended by a large crowd. Well-worn paths in the grass around the well mark the site of the rounds of the well. Near the well are the ruins of MacEnery castle. According to legend the well moved when clothes were washed in it. 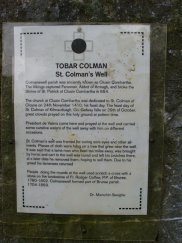 St Colman's well is in the townland of Gortroe. This well is just a short walk from the church in Colmanswell. The grounds around the well are extensive and feature a wooden bridge that leads into the well. This work at the well was completed in 1996 and in April 1999, the Bishop of Cloyne, John Magee, planted a Millennium tree here. 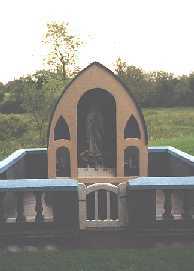 The well is now covered over and there is a large statue of St. Colman above it. The feastday at the well is celebrated on October 29th. There is some confusion as to which St. Colman is honoured in the parish. The feastday celebrated at the well is that of St Colman of Kilmacduagh. However, the parish is on the borders of the Diocese of Cloyne, and so, many believe that St Colman of Cloyne is actually the patron saint of the well. In addition to this the church itself is dedicated to St Colman of Cloyne. The well is known for curing eye complaints. 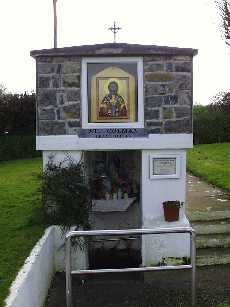 President de Valera came to pray at the well on several occasions, and carried away curative waters with him. There are two interesting stories that Danaher mentions in his "Holy Wells of Co. Limerick" regarding this well. A man who was cured left his crutches at the well but came back and took the crutches to try to sell them. The man was then struck lame again. The second story tells of a man who worked on pattern day who found that the money he had earned vanished from his pocket as he passed the well. People doing rounds at the well used to scratch a cross with a stone on the tombstone of Fr Rodger Coffee, P.P. of Bruree 1780-1802. There is also another well in the parish. The well is called St Gobnait's well but it was also known as St Debora/Deriola's well. St. Gobnait was a saint who came from Ballyvourney in Co. Cork. Danaher said that rounds were made and a pattern was held on February 11th until around 1870. The well has now dried up but the site is still known. According to the parish priest, St Gobnait's well is situated to the North of Ballyagran in a high field to the left of the road to Castletown. It is believed that St. Gobnait lived here and legend claimed that a white stag could sometimes be seen at the well.